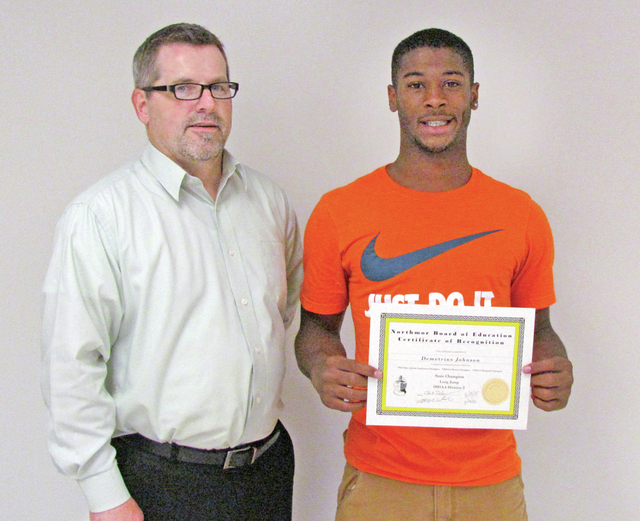 Randa Wagner | Morrow County Sentinel Freshman Demetrius Johnson was the OHSAA State Track Long Jump Champion and received recognition from the board for his athletic accomplishments. He is shown with Board President Jeff Whisler. The Northmor Board of Education recognized freshman Demetrius Johnson as the MOAC District Champion, Regional Champion and the Division 3 State Long Jump Champion at the June 18 board meeting. Supt. Chad Redmon said Johnson’s farthest jump this year was 22 feet 4 inches. Johnson was one of three local athletes to make first team. Earlier this year he told the Sentinel he wasn’t even planning to run track this year initially. He wanted to focus on basketball and didn’t think he would excel, but after this year, “I think I’ll stick it out,” he said. Until the spring of 2014, Johnson was a student in the Columbus South school district. “I’ve made a lot of friends and they support me,” he said of the move to a new district and county. The board also had a certificate for Head Boys’ Track Coach Kevin Ruhl for his contributions toward the achievement. The board approved the Medical Mutual Insurance contract for the 2015-2016 school year at an increased rate of 4.53% over 2014-2015. The Family Plan is $1,393.30 and the Single Plan is $552.92. The district pays 85 percent and employees pays 15 percent of the cost. The board approved an expenditure and payment of $14,800 to Food Service Coordinator Nikki Morrison from reimbursements made by the Mt. Gilead Village Board of Education for their part of shared services for Fiscal Years 2014 and 2015. The agreement was that Mt. Gilead Schools would reimburse the Northmor Board at the rate of $275.00 per day for 72 days for each of the two Fiscal Years. The board also approve a payment of $16,209.78 to Highland Local School District for shared services for Debra Knechtly, Preschool Director for the 2014-2015 school year. During public participation, a resident asked if the amount of $18,000 dollars was correct for the Title 1 Coordinator’s position. The board agreed to pay Rebecca Oliver as the Title 1 Coordinator for the past school year (in the amount of $18,000 for the year), which is paid by Title 1 funds. “It’s my understanding most Title 1 Coordinator are (paid) $5000 dollars a year or less,” he said. On another matter, Cowell said the board received information from Alliance Medical Billing that, based on some issues in the past with medicaid billing across state. They were able to get a payment from Medicaid for Northmor in the amount of $56,000 dollars that they were not expecting. The funds date back from 2000 to 2007 and are part of Medicaid’s efforts to ‘getting all the billing cleared up’ from that period. Cowell said those funds will go into the general fund. Fee lists for the 2015-2016 school year were approved. The elementary school will have a uniform the across-the-board fee of $30 dollars for grades K thru 6. Junior high fees remain the same and the only change for the high school fees are $10 for a new computer class.